John Wells’s phonetic blog: you ARE a dark horse! Tami Date asked for my comments on the accent pattern of the underlined parts below. (1) A: The Joneses have got a new car. B: Have they, indeed. What model is it, dear? A: Oh, I don’t know. It's a pale blue. B: Well, well. Old Ted IS a dark horse. I was only talking cars with him the other night. A: And he didn't mention it? (2) A: I've just got engaged to Sheila. partly because you can produce any number of such constructions ad lib and partly because an idiom is something I think of as not predictable by simple logic. “Any number of such constructions?” I've been trying to think of some. I have to say I have not been very successful in this task. What we want is an accented verb to be followed by lexical material that is new in context but unaccented. You are a clever boy/girl. Compare also the possibility of placing the nucleus on an intensifying word, despite following new lexical material. I was extremely annoyed with them. I can’t think of any others. Jack? All these, including you are a dark horse, are exclamations, and as such must have a falling tone of some kind (low fall, high fall, rise-fall). I'm not sure what exactly you mean by "any others" - would the idiomatic stressed use of "some" qualify? No, it wouldn't. For B you would still get the nuclear accent on "dancer" (unless there are reasons to deaccent it). I am looking for accented "be" followed by new lexical material. For me, the sentence "You are an X, and no mistake", with sentential stress as marked, can be filled by almost any X that describes something not obvious. Examples that have come up for me are "blithering idiot" and "master of the game", but there are five million ghits for the construction. The same would apply for all other persons and numbers. What's more, leaving out the last four words is not a problem, at least for me, in context. It doesn't have to be the verb to be, does it? Oh you DO look smart! Oh, she DID seem sad! Oh, it HAS turned cold! I would think that in at least "you are an X, aren't you?" (with the tag question at the end), X can be anything that can be derived from context, and as such is not as much "new in context" as it is old information rephrased. It would probably work without the tag question with proper intonation. E.g. "I just got him to sign the contract." "My, you are a sneaky basterd, aren't you?" For B you would still get the nuclear accent on "dancer" (unless there are reasons to deaccent it). The part qualified by "some" isn't new anyway, in fact the point is it's a comment on A's mention of it. But concerning the nucleus, thinking about it, this might make the difference between a great ballerina ('some 'dancer), a pole dancer ('some dancer) and some dancer (some 'dancer), or am I mistaken there? Mr. Wells, I think that you are conflating a particular use of the idiom "dark horse" with its proper, or at least its older, meaning. I am pretty sure that the term does not, or at least did not originally, mean "someone who is not well known and who surprises people by winning a competition." That was how I used to understand it until a friend corrected me, and I find from various sources (example: http://idioms.thefreedictionary.com/dark+horse) that my friend was right: it means, or originally meant, simply a competitor about which not much is known -- not specifically an unlikely victor. I keep saying "means, or originally meant" because I am not sure to what extent one can use historical usage as a basis for claims of correctness here. E.g., people these days commonly use the phrase "sour grapes" to mean "bitterness about losing," when the term derives from a fable of Aesop and on that basis means -- I would say "properly means," but maybe I'm just a crank -- "disparagement of a prize that one has failed to win." 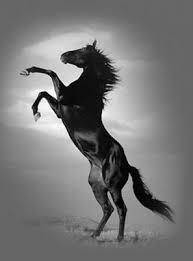 "Dark horse" originally referred only to horses, and in that sense did and does mean "little-known". But in its extension to politics, the two senses are much the same, since in a democracy a little-known candidate is indeed an unlikely victor. The first political "dark horse" was James K. Polk in 1844, who won the (U.S.) Democratic Party nomination and then the Presidency over a large field of much better known candidates, probably because no one had anything against him. His opponents mocked him with the slogan "Who is James K. Polk? ", but to no avail.